I just put together these two photos, taken many years apart. The cool thing is that both boats, my old beloved Touch Wood and Surprise were shot from the same angle on similar days. If you shrink the Folkboat picture a little to get them into the same scale you have a wonderful illustration of the basic similarities between the two types, and the lineage of the one from the other is clear. 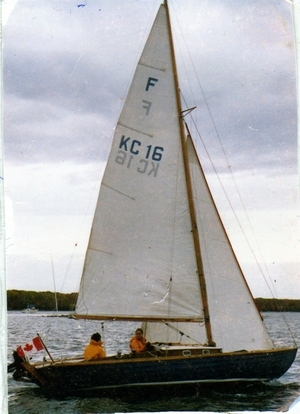 She came to Toronto's National Yacht Club and was bought from Hansen by Pat Talbot - one of the first Folkboats in North America. 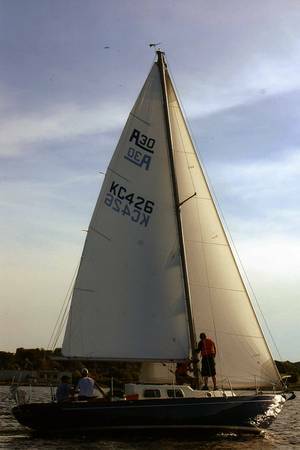 The direct link to the A30 was the Canadian Folkboat Association's committee of NYC members going back to Hansen and challenging him to come up with a larger successor to the Folkboat; Hansen went to Alberg and our A30 was the response. I owned Touch Wood from '79 to 99...and as I wrote on the list last winter, got her back in March of this year .